There are lots of people who know lots more about preserving veggies than I do. I tend to eat them, freeze them, share them with neighbors, or feed them to the chickens (if I ignore them too long — at least they turn into eggs). Here are a few great articles about storing your produce that do a far better job than I do. From Wild Fermentation – Making Sour Pickles — This site and the author of the books featured there is a fantastic resource for fermented and preserved foods. Not all of you are probably used to scapes, the flowering stalks of onions, garlic, and shallots. I tend to chop mine up when I first receive them (much like I’ve been doing with my green garlic) and pull handfulls out whenever I would usually add garlic or onions to a dish. When the pile gets too large because I’m not using it up, I made pesto with the pre-chopped scapes. Our co-manager, Helena, made this dish this week and wanted to share it with everyone. Pipe in with your own suggestions. Quick note: We’ve all become so accustomed to baby spinach in giant clamshells, we probably don’t recognize it when it gets to be full-grown. I had to taste mine because I thought it was Chinese broccoli, and I neglected to pass on David’s notes to you all on Tuesday. Those big, stemmy, flowering greens we received this week are spinach. The entire thing is edible, flowers and all, and David says it is much more common to see it that way in Asia (where he grew up). He’s also quite excited that the spinach is producing large roots this year. After another week of harvesting tender leaves, we might see something pretty unique — edible spinach roots. I will be sure to have David give us at least one recipe for how his mother prepares them. I understand we’ve received three weeks in a row of certain vegetables. Some of them (maybe collards?) are things with strong smells or unfamiliar flavors. Others are just coming in volume, week after week. This passes, as the summer heat causes things to bolt, mature, and wither, and so we just learn to love them in their season — too soon they will be gone. This week, I’m going to cheat a bit and direct you to a college friend’s farm blog in Virginia. 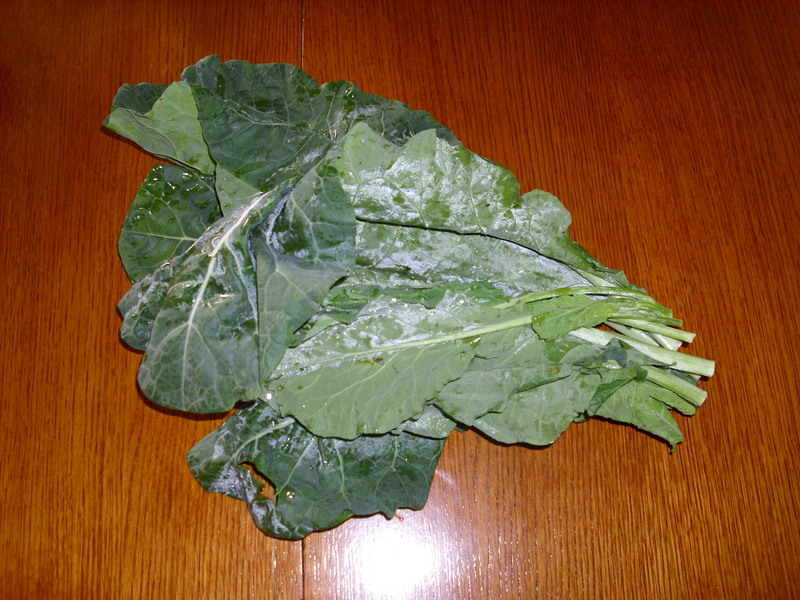 Lisa of Frog Bottom Farm has a great rundown on collards, and I challenge you to try a couple of her ideas. I think the turnip greens, and probably the mustard, would substitute well for all but the longest cooking methods. I’m going to cheat again by directing you to a Mark Bittman article on slaw salads in the New York Times from 2011. The recipe of interest for what is probably building up in your fridge is the Kohlrabi-Sesame Slaw, but as we head towards summer we should also see Asian radishes, lots of choy-type cabbages, and a few beets that overwintered and are growing again. A little chopping (OK, a lot) on delivery day and you have a side salad that only improves in flavor all week. Another item you’re going to be inundated with, if you don’t use several stalks a day with your greens, is young garlic. They’re basically the garlicky version of green onions — not as strong as garlic, but stronger than scallions. Use them as a cross between the two, and you’re set for soups, sautees, stir-fries, and sauces. Add them to your simple skillet greens, your omelets, your asparagus, and your pilafs / fried rices. Replace the basil in pesto and you can use up a large amount of them all at once, and this can be frozen or keep in the fridge for many weeks. Lastly, and maybe most importantly, I will repost a favored link on the blanching and freezing of greens (almost everything except lettuce). Piles of mustard building up? Spinach you can’t use this week? They’ll keep in the freezer, and you can add them to soups or serve as pot greens (with ham and potatoes?) later in the summer without any loss of quality. Have you eaten it all yet? This week’s share start tomorrow! Have you used up last week’s yet? Don’t worry, neither have I. So, what can we do with all that leftover produce? Some things keep well until more of them show up. Parsnips, collards, radishes, kohlrabi. Time to get the rest used up! – Salad greens and microgreens — the first half of the week was a salad a day for lunch. But that one is easy. – Spinach — I stuck it into soups, omelets, and salads. – Asparagus — We ate all of it in one meal. Sauteed with bacon and garlic, served with a béchamel sauce (brown a little flour in a stick of butter, then slowly stir in two cups of milk until a thick sauce forms). Not the healthiest meal this week, but tasty! 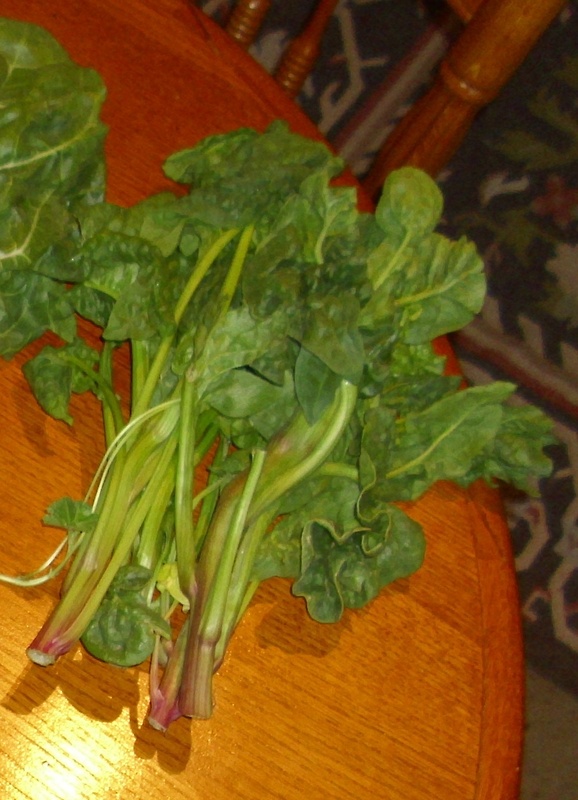 – Mustard greens and chard — I have eaten easy sauteed or braised greens almost every day this week. Sometimes I use bacon or sausage for flavor, but last night was just greens with ginger and garlic, splashed with lemon juice. – Kohlrabi — It tastes like a cross between turnips and cabbage, but milder and quite pleasant. Try peeling it, slicing it, and sautéing with a sliced apple in butter (with a pinch of salt). Makes a slightly sweet side to more strongly flavored greens. – Radishes and turnips — Eaten raw, as snacks with cheese and olives. – Kale — This kale is crunchy, but it gets tender if you let it rest tossed with some olive oil and salt. Salad for tomorrow lunch. Here are three of the less common veggies we’re getting this week, with some storage and use tips. I’m trying to frontload the posts and give general ideas rather than specific recipes. A root vegetable, also called swedes (England) / yellow turnips (US) / turnips (Ireland) / neeps (Scotland), they are actually more closely related to cabbage. To quote Samwise, “Roast ’em, Mash ’em, Stick ’em in a Stew.” They have a flavor similar to turnips, but better. You can use them interchangeably in root veg recipes — mash them with potatoes, put them in soups, roast them with other roots. Store them loosely wrapped in plastic with your beets and turnips in the bottom of the fridge. Fun fact: The Irish traditionally carved rutabaga for Halloween (which was a Celtic holiday) — pumpkins were an American development. They look like fat white carrots, but they’re sweeter and nuttier in flavor and richer in nutrition. The centers can be woody if the weather was wrong, but those are still good for soups (remove the hard cores when ready to serve). This is a fantastic veg to roast, and shines by itself. Roast them with butter, cardamom, and coriander. Another good use is to roast or mash them with the rutabaga and potatoes. I flogged this horse in the spring. See here here and here. We have a lot of interesting root veggies to roast or mash — these work there, too!